Catalyst Pharmaceuticals, Inc. (Catalyst) (Nasdaq: CPRX), a biopharmaceutical company focused on developing and commercializing innovative therapies for people with rare debilitating, chronic neuromuscular and neurological diseases, announced that the U.S. Food and Drug Administration (FDA) has approved Firdapse® (amifampridine) 10 mg tablets for the treatment of adults with Lambert-Eaton Myasthenic Syndrome (LEMS). 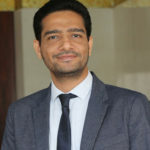 Firdapse is expected to be commercially available early in the first quarter of 2019. For full prescribing information, please click here. The most common side effects experienced by patients in the clinical trials were burning or prickling sensation (paresthesia), upper respiratory tract infection, abdominal pain, nausea, diarrhea, headache, elevated liver enzymes, back pain, hypertension and muscle spasms. LEMS is a rare antibody-mediated autoimmune disease of neuromuscular transmission. Amifampridine is recommended as first-line treatment for LEMS. LEMS is a rare autoimmune disease that affects approximately 1 in 100,000 people in the United States. The most common symptoms of LEMS are proximal muscle weakness and fatigue. Symptoms can be life threatening when the weakness involves respiratory muscles. Approximately 50% of LEMS patients have an underlying malignancy, typically small cell lung cancer. The submission of the Firdapse NDA came following positive results from two Phase 3 studies where patients treated with Firdapse experienced rapid, significant and sustained improvements in muscle function, and reduced weakness and fatigability compared to patients receiving placebo. These benefits were observed by both patients and physicians. Please see below for Important Safety Information. Firdapse had previously received Orphan Drug designation and Breakthrough Therapy designation, as well as Priority Review from the FDA. Firdapse is the first and only approved drug in Europe for treatment of LEMS. Catalyst Pathways™ is an optional, free, personalized program that offers patients and their families one-on-one support throughout their treatment journey with a dedicated team of specialists to help them manage their unique challenges. The support team for each enrolled patient at Catalyst Pathways includes a Care Coordinator, with extensive experience in health care; an Insurance Navigator, to help them understand their insurance coverage and the prescription drug benefit process; a Patient Assistance Liaison, to assist them in understanding their disease and their prescription, and a specialty pharmacy experienced in supporting rare disease patients to provide direct-to-patient delivery of prescriptions. The Catalyst Pathways support team also helps enrolled patients understand and access financial assistance options for qualifying patients, including a copay support program designed to minimize the patient’s burden of out-of-pocket costs. For more information on Catalyst Pathways click here. Catalyst will host a conference call and webcast to discuss its commercialization plan for Firdapse, including the cost of therapy, on December 13, 2018 at 8:30 AM ET. Investors who wish to participate in the conference call may do so by dialing (877) 407-8912 for domestic and Canadian callers or (201) 689-8059 for international callers. Those interested in listening to the conference call live via the internet may do so by visiting the Investors page of the company’s website at www.catalystpharma.com and clicking on the webcast link on the Investors home page. A webcast replay will be available on the Catalyst website following the call by visiting the Investor page of the company’s website at https://www.catalystpharma.com. LEMS, is a rare autoimmune disorder, most often characterized by fatigable limb muscle weakness. The disease is caused by autoantibodies against voltage-gated calcium channels located in the nerve-muscle junction, resulting in improper nerve-muscle communication, leading to progressive muscle weakness, when left untreated. In approximately 50% of cases, LEMS is associated with an underlying malignancy, most commonly small cell lung cancer, and in some individuals, LEMS is the first symptom of such malignancy. LEMS generally affects the extremities, especially the legs. In early course of the disease, muscles closest to the trunk are affected, which are manifested as difficulties with climbing stairs or rising from a sitting position. Physical exercise and high temperatures tend to worsen the symptoms. Other symptoms occasionally seen include weakness of the muscles of the mouth, throat, and eyes. Individuals affected with LEMS also may have a disruption of the autonomic nervous system, with symptoms of dry mouth, dry skin, constipation, blurred vision, impaired sweating, and/or inappropriate blood pressure variations. 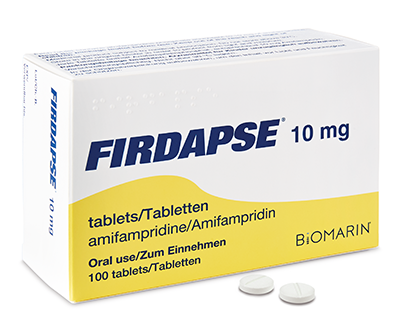 Firdapse® (amifampridine) 10 mg tablets is an oral, nonspecific, voltage-dependent, potassium (K+) channel blocker that causes depolarization of the presynaptic membrane and slows or inhibits repolarization. This action results in the opening of slow voltage-dependent calcium (Ca2+) channels, allowing for a subsequent influx of Ca2+. In turn, it induces the exocytosis of synaptic vesicles containing Acetylcholine (ACh) to release more ACh into the synaptic cleft, enhancing neuromuscular transmission, and providing for improved muscle function. Firdapse is approved in the U.S. and the European Union for use by patients with LEMS. 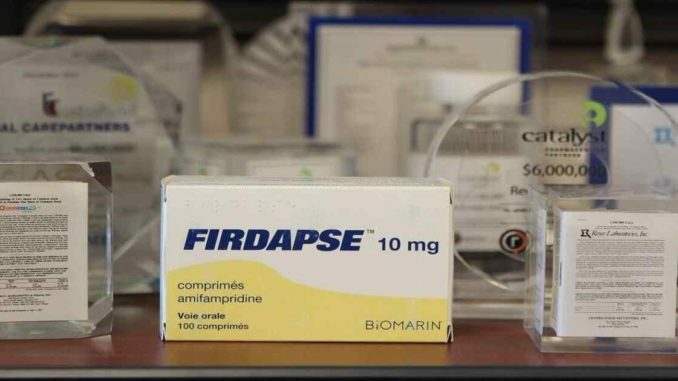 Seizures: FIRDAPSE can cause seizures. Consider discontinuation or dose reduction of FIRDAPSE in patients who have a seizure while on treatment. FIRDAPSE is contraindicated in patients with a history of seizures. Hypersensitivity: If a hypersensitivity reaction such as anaphylaxis occurs, FIRDAPSE should be discontinued and appropriate therapy initiated. The most common (> 10%) adverse reactions are: paresthesia, upper respiratory tract infection, abdominal pain, nausea, diarrhea, headache, elevated liver enzymes, back pain, hypertension, and muscle spasms. To report SUSPECTED ADVERSE REACTIONS, contact Catalyst Pharmaceuticals at 1-844-347-3277 (1‑844-FIRDAPSE) or FDA at 1-800-FDA-1088 or www.fda.gov/medwatch. Catalyst Pharmaceuticals is a biopharmaceutical company focused on developing and commercializing innovative therapies for people with rare debilitating, chronic neuromuscular and neurological diseases, including LEMS, congenital myasthenic syndromes (CMS), MuSK antibody positive myasthenia gravis (MuSK-MG), and spinal muscular atrophy (SMA) type 3. Amifampridine phosphate has received Orphan Drug Designation from the United States FDA for CMS and myasthenia gravis. Firdapse (amifampridine) 10 mg tablets is the first and only approved drug in Europe for symptomatic treatment in adults with LEMS. Catalyst is also developing a generic version of vigabatrin. This press release contains forward-looking statements. Forward-looking statements involve known and unknown risks and uncertainties, which may cause Catalyst’s actual results in future periods to differ materially from forecasted results. A number of factors, including (i) whether Catalyst will be successful in commercializing Firdapse (ii) whether, even if Catalyst is successful in commercializing Firdapse, Catalyst will become profitable, (iii) whether Firdapse will ever be approved for the treatment of CMS, MuSK-MG, SMA type 3, or any other disease, and (iv) those other factors described in Catalyst’s Annual Report on Form 10-K for the fiscal year 2017 and its other filings with the U.S. Securities and Exchange Commission (SEC), could adversely affect Catalyst. Copies of Catalyst’s filings with the SEC are available from the SEC, may be found on Catalyst’s website, or may be obtained upon request from Catalyst. Catalyst does not undertake any obligation to update the information contained herein, which speaks only as of this date.